Dove Dale in the early morning, taken from the lower slopes of Thorpe Cloud. 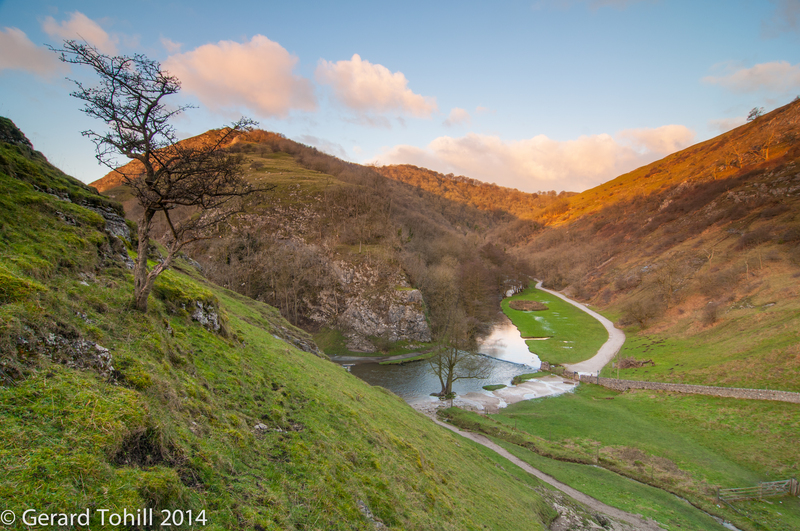 Later in the day, this will be a busy scene – Dove Dale is understandably popular and can get very busy. The path heads north up the valley for a few miles, crossing at the old packhorse bridge a couple of miles upstream. Photography stuff: 12-24mm lens at 12mm, 1/6 sec at f/9.0, tripod, two stop graduated ND filter. Thank you. That’s actually quite a difficult question – every time I’ve visited the Peak District there’s always been something to photograph. That said, we visited in late summer/early autumn last year, and the quality of the light around sunrise and sunset was awesome. I also picked up a little book called “The Photographer’s Guide to the Peak District” and it was invaluable in helping me find good locations. If you head to the north of the Peak District (Castleton/Bamford/Ladybower area) then you’ll be spoiled for choice. Mam Tor is recommended for an early morning shoot, with views in almost every direction and easy access. I’m definitely a fan of this area.